A deliciously lighter version of the all-American meal. To make the meatloaf, place the ground turkey, onion, celery, green pepper and garlic into a large mixing bowl. Add the remaining ingredients EXCEPT the ketchup, and mix well using your freshly-washed hands. Spread mixture into an 8×8-inch baking dish. Smooth, then spread the ketchup evenly over top for a nice glaze. Wrap the heads of garlic separately in two pieces of aluminum foil. Place the meatloaf, uncovered, and the wrapped garlic heads on the middle rack in the oven and bake 1 hour. To make the mashed potatoes, place potatoes and water in a stock pot. Bring to a boil over medium-high heat. Once boiling, reduce heat to medium, cover pot, and continue cooking until potatoes are tender, about 20-30 minutes. Drain water, then add remaining ingredients to pot. NOTE: For the roasted garlic, remove heads from foil, peel cloves off and squeeze gently. The cloves should be brown, soft and very easy to remove. Mash potatoes until desired consistency is achieved. 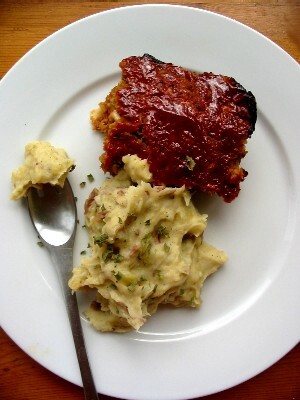 Serve meatloaf and potatoes immediately, garnished with extra sour cream and chives if desired.